After a hard day’s work enter a worry-free world of fun. Nothing to do in this stunning high floor 2 bedroom 2 bath modern beauty but take a dip in the pool/ steamy hot tub, get in a few sets of tennis, or watch the city lights twinkle from your elegant lanai. Enjoy over 1,300 square feet of gracious indoor-outdoor living in the Royal Iolani condominium. Location of building is superb, near top schools, shopping and parks. Secured building with ample guest parking. Great Amenities too. Come see today! Please, send me more information on this property: MLS# 201904197 – $759,000 – 583 Kamoku Street Unit 3007, Honolulu, HI 96826. 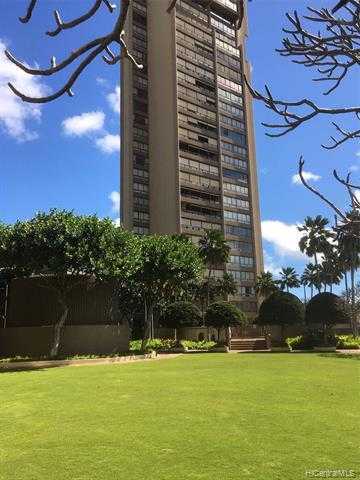 I would like to schedule a private showing for this property: MLS# 201904197 – $759,000 – 583 Kamoku Street Unit 3007, Honolulu, HI 96826.